You use various build arguments with your Jekyll project. 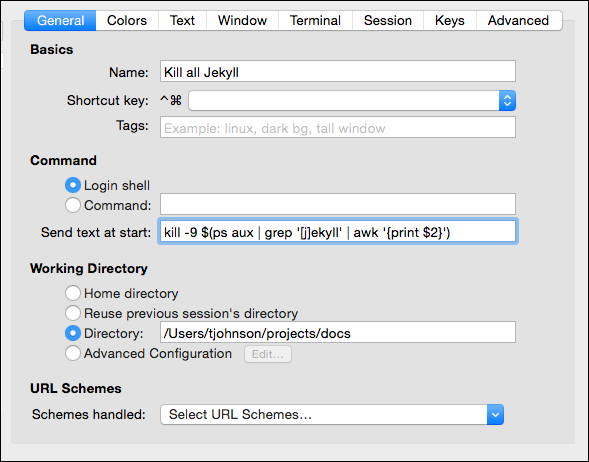 You can also create shell scripts to act as shortcuts for long build commands. You can store the commands in iTerm as profiles as well. Here the configs/myspecialconfig.yml file is used instead of _config.yml. The destination directory is ../doc_outputs, which would be one level up from your current directory. My preference is to add the scripts to profiles in iTerm. See iTerm Profiles for more details. When you’re done with the preview server, press Ctrl+C to exit out of it. If you exit iTerm or Terminal without shutting down the server, the next time you build your site, or if you build multiple sites with the same port, you may get a server-already-in-use message. Find the PID (for example, it looks like “22298”). Then type kill -9 22298 where “22298” is the PID.